We are having a WONDERFUL day! The temperature continues to rise and has registered above freezing for several hours now. The trees are starting to look like trees again as the ice melts and the trees straighten up. We even have electricity! Life is getting back to normal. This tamarack is the first tree we checked on after the ice storm. Tamarack trees are very rare in this area. They have green needles during the summer months like pines or hemlocks, but these trees are unique because their needles turn a golden color in the fall. They are a very beautiful tree, and we are so grateful that ours survived this storm with so little damage. It looked like a different world out there the morning after the ice storm. 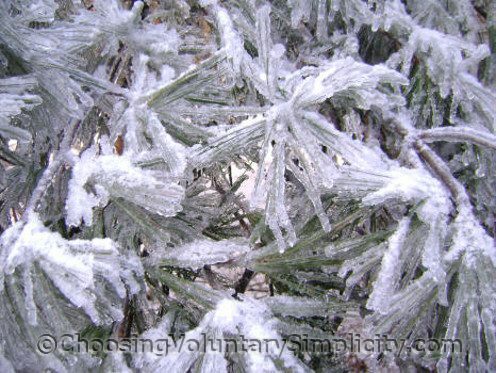 A heavy rain all night long with temperatures below freezing had coated EVERYTHING with a thick layer of ice… and as temperatures continued to drop, a thin covering of very fine snow fell to cover the ice. The pines suffered the worst damage. 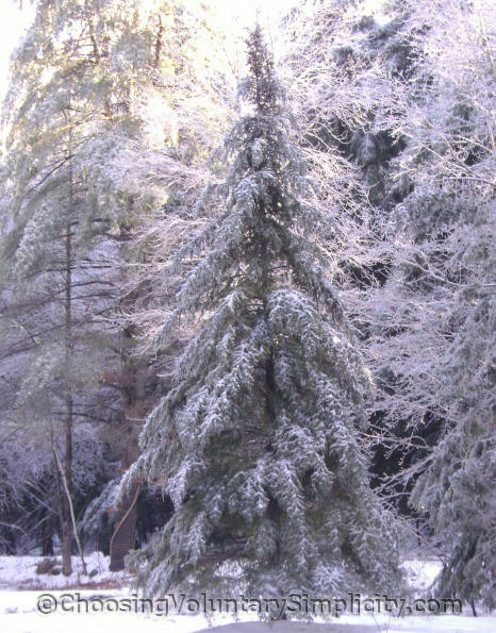 The weight of all that ice on the dense needles made many of the larger branches break, and many of the taller pines lost their entire top sections. A large number of the pines that remained standing were bent almost double from the weight of the ice. 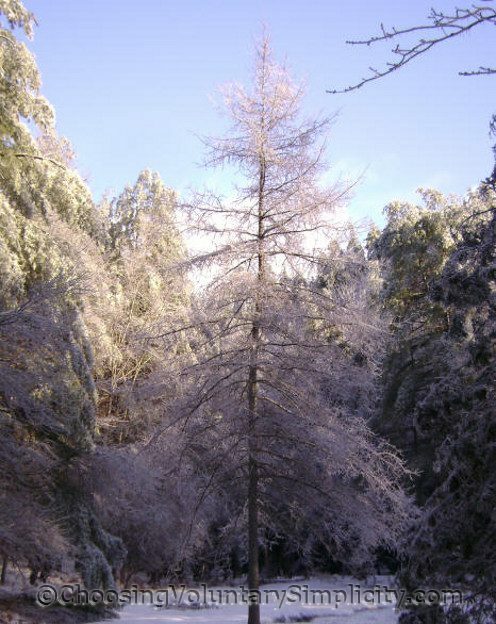 The trees without leaves or needles suffered very little damage, although they were totally covered with ice. 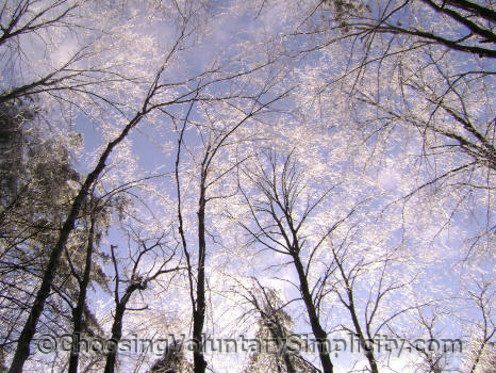 Even this morning, after most of the ice has melted, the smooth-barked trees are still glossy and ice-coated, but most are returning to an upright position. Only one of our wild apple trees was completely destroyed. 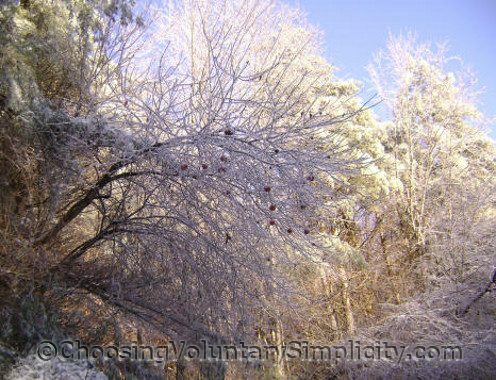 Even with all the damage, we couldn’t help noticing how beautifully all the ice-covered trees sparkled in the bright sunshine. Looking up at the branches coated with ice was like looking through crystal. We have a lot to be thankful for. We lost trees and fences were destroyed, but there was no serious structural damage, even though trees and branches fell on both our house and our barn. More importantly, no one was physically hurt. We had some terribly anxious moments when the trees were falling, and again yesterday morning when my husband was walking back to the house after feeding the goat. 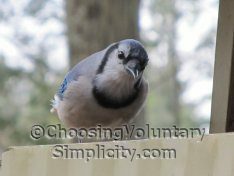 He heard a loud cracking sound in the pines just over his head, and recognizing the sound after watching trees fall all the previous day, he knew what was about to happen and immediately started to run toward the house. The rest of us watched in horror as he slipped on the ice and fell flat on the ground, and the top several feet of a large pine tree fell and landed… seemingly right on top of my husband as he lay there on the ground. Amazingly the bulk of the tree missed hitting him by inches. It seemed impossible, but he was not hurt at all. It was a timely reminder… with a powerful message to keep everything in the proper perspective. So glad you have your power back. This cold spell is really wild. It is supposed to get down to 21 tonight here in the “sunny south”. It is dry though, thats good. We don’t know how to handle icy weather here in Texas!! Wow — awesome pictures! I never knew ice could look like that, scary and beautiful at the same time. I’m so glad your husband was o.k. You must have been terrified until you saw him stand up and walk away from the tree. I love your blog. What a blessing that your dh wasn’t hurt or worse. Just another wonderful example of how the Lord watches over us all the time. Your blog is the first one I read every morning. Thanks for sharing your life with all of us. Very beautiful picture! I also live in the nature. There are not neighbors around my house.It’s cold area here . But I haven’t seen like these beautiful trees!! I would like to see more your pictures.